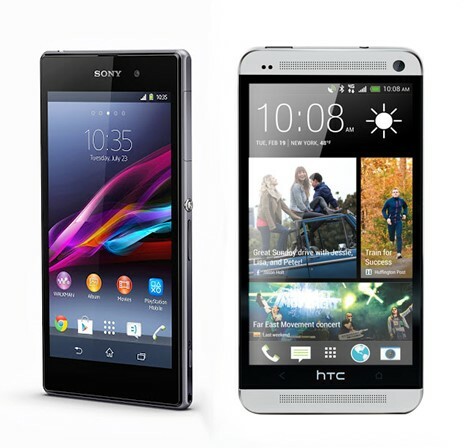 Sony and HTC are two such popular brands in the smartphone arena. Both of these reputed brands are known to deliver some of their finest devices in this industry and have got a fan base of millions of people worldwide. One of the Sony’s recent additions, the Xperia Z1 is becoming a huge hit in the market due to its awesome built and features. On the other hand, to give a strong competition to it is HTC One which is an equally good. To understand the difference between them in a better manner, here is a brief comparison on them. Both these devices consist of a microSIM slot and are touch based. The dimensions of Xperia Z1 are 144 x 74 x 8.5 mm, which is slightly larger than the 137.4 x 68.2 x 9.3 mm. The bigger size makes the X1 around 25 grams heavier than the HTC One. The display of Xperia Z1 and HTC One is really good and offers a perfect picture setting to the user. The screen size of the former stand at 45 inches, whereas in HTC One it is just 4.7 inches. Both of them have got a screen resolution of 1080 x 1920 pixels. There is also difference in the technology of the two as Z1 consists of TFT screen, whereas HTC One is based on SuperLCD3 technology. Sony has got it right with the 20.7 MP camera, which has got more than four time higher camera resolution then HTC One. Even though the picture clicked from HTC One may be considered as decent but it is no match to the Exmor technology that is used in Z1. However, there is hardly any difference in the secondary camera of these devices. Sony Xperia Z1 and HTC One both consists of a non removable batteries, however Z1 boasts of a bigger battery, i.e., 3000 mAh that offers you up to 880 hours of standby time and 15 hours of standby time. On the other hand, HTC One consist of a 2300 mAh battery which offers up to 500 hours of standby time and 27 hours of talk time. Nowadays there is a demand for fast devices and Xperia Z1 and HTC One falls into this category. A powerful processor or 2.2 GHz Quad Core processor powers this device against the 1.7 GHz Quad Core processor. Both of these devices are backed by 1 GB RAM. You will find android version 4.3 Jelly Bean installed in Sony Xperia Z1, whereas version 4.1.2 is pre installed in HTC One. About Author: Anzer Khan is a professional article writer and specializes in writing articles on smartphones and tablets. You should watch out for the best Xperia Z1 price in UK to get the best deals.